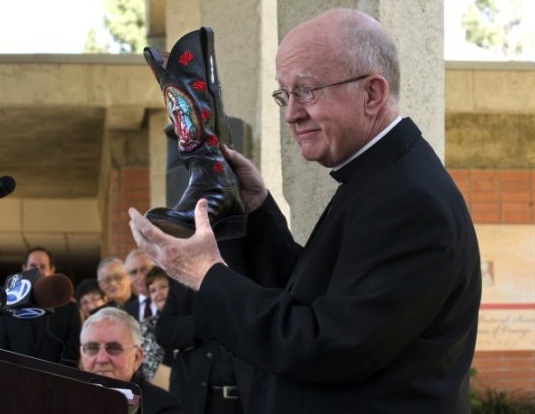 Whispers in the Loggia: Release the Crystal – Live from Orange, Bishop Vann's "Hour of Power"
Release the Crystal – Live from Orange, Bishop Vann's "Hour of Power"
Querido Monseñor Kevin, bienvenidos a tu catedral... well, soon enough. Even if four metropolitans took office on these shores during 2012, if you're talking numbers, only tomorrow will American Catholicism's Installation of the Year take place – with 1.3 million members, after all, the diocese of Orange is far larger than each of the four archdioceses to change hands this year... indeed, it's bigger than three of the quartet (namely, Baltimore, San Francisco and Indianpolis) combined. Already being greeted in the local press as akin to "a force of nature" – a reality that's no secret to this readership – the festivities to welcome the 61 year-old "social butterfly" to California begin tonight at his soon-to-be seat, in the Arboretum of Crystal Cathedral, bought by the diocese for $57.5 million last year and, with the name Christ Cathedral, expected to be consecrated as Orange's mother-church sometime around 2015. The SoCal metropolitan and a close Vann friend, Archbishop José Gomez of Los Angeles – who ordained his new suffragan as bishop of Fort Worth in 2005 – is slated to preach tonight's Vespers service. 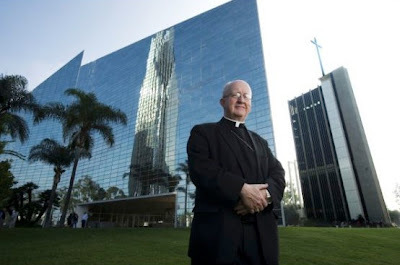 Initially foreseen for one of the diocese's larger parish churches, meanwhile, tomorrow's installation Mass will instead be held in the 5,000-seat events center at UC Irvine; for locals, the rites are open to the public, while for those at a distance, the liturgy will be webstreamed from 1.30pm Pacific. Querida Virgen-Madre, amadísima Morenita nuestra, alumbra tu hijo dedicado, su nuevo pueblo y todos nosotros hoy y siempre.